Ted joins with local officials to celebrate the new Groves Memorial Community Hospital “Closing In” event on October 10, 2018. It’s wonderful to be here, and great to see all of you, as we gather again to mark yet another milestone in the construction of our new Groves Memorial Community Hospital. And while my role at Queen’s Park is no longer a partisan one, I don’t know how anyone could question my being here, as your MPP, to extend my sincere thanks to all of you. You know, Dr. Abraham Groves, upon his passing, left his hospital to our community, so many years ago…but he also bequeathed to us his vision of community-based, compassionate and caring health care, animated by the twin values of working together as a team, and always putting patients first. That vision continues to inspire all of us today, but most of all, it inspires the Staff and Volunteers who are associated with Groves Hospital. Yesterday, I picked up a new book written by our former Governor General, David Johnston. It just came out. The book is called “Trust: Twenty Ways to Build a Better Country.” David Johnston writes that trust is the bedrock of democracy, but laments the fact that trust is not thriving in democracies today, including our own. To me, that is an understatement. He tells us that leaders and aspiring leaders must make themselves worthy of trust, must seek to build trust around them, and must work to create a trustworthy and trusted country. Simple and eloquent concepts, simply and eloquently stated…but why is it that these ideas seem so old fashioned today? Why does an esteemed former Governor General feel it necessary to write a book about this? Why does trust seem so elusive in our world today? Last night as I was reading the book, it struck me that for the staff and volunteers of Groves Memorial Hospital, at least trust isn’t an issue. Trust has been earned, over the decades. For Groves, trust is a given. In Centre Wellington, we’ve been committed to “health quality indicators” since Dr. Groves started his practice in 1871, even though we didn’t call it that. We’ve been doing “health care integration” before the Government invented the term. We were “putting patients first” before anybody used that expression at Queen’s Park. So, in Groves we trust. And that trust has led us to an absolutely extraordinary community effort: first to advocate for our new hospital, now to support its construction, soon to equip it, and eventually to see it open its doors, and begin to serve patients here, on this new site. This project was first approved in the fall of 2011, by the former Provincial Government. From the beginning, we refused to allow it to become a political football, because the local health care of our residents is too important for that. We set partisan politics aside, and worked across party lines to get this done. But our deepest gratitude must be extended to the staff of the Groves Memorial Community Hospital, our dedicated and energetic Volunteer Association, the Board, the Foundation, our donors, indeed the entire community, everyone in our catchment area, for your patience and perseverance, which has brought us to this day. This morning, we have seen the progress that’s been made. Touring the site today, I have been impressed by the innovation, the thoughtfulness, and the collaboration which is evident in every aspect of the design and the construction. On the weekend, we celebrated Thanksgiving with our families. Today, let us give thanks for our new hospital, soon to be completed, and the amazing community we call home, making it all possible. 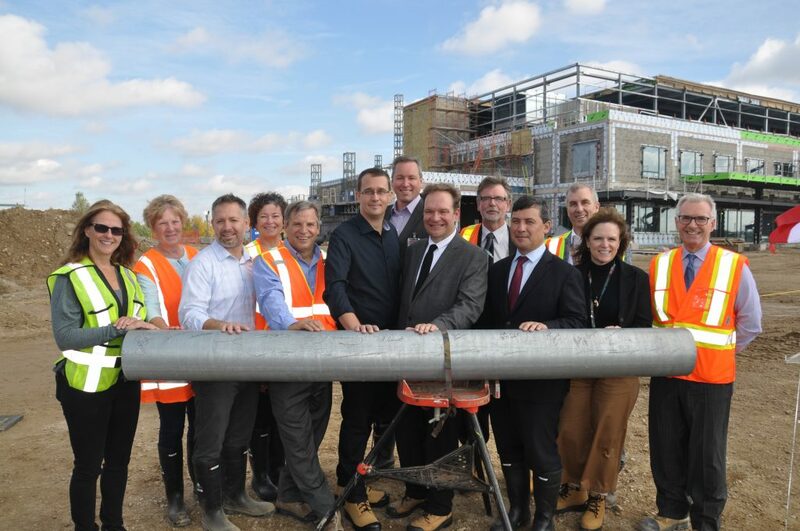 New Groves Hospital August Progress	Merry Christmas from MPP Ted Arnott!